Carcinogenesis is believed to be a multi-step process, progressing sequentially from normal to hyperplastic, to in situ, and to invasive stages. A number of studies, however, have detected malignancy-associated alterations in normal or hyperplastic tissues. As the molecular profile and clinical features of these tissues have not been defined, the authors invited several well-recognized pathologist, oncologists, biologist, surgeons, and molecular biologist to offer their opinion on: (1) whether these tissues belong to a previously unrevealed malignant entity or focal alterations with no significant consequence? (2) whether these alterations are linked to early onset of cancer or cancer of unknown primary site, and (3) how to further define these lesions? It is a commonly held belief that carcinogenesis is a multi-step process, progressing sequentially from normal to hyperplastic, to in situ, and to invasive stages [1-3]. Progression from one stage to another is believed to result from increasing accumulation of hereditary mutations in major regulatory genes or uncorrected and acquired mutations in somatic genes [4-6]. It is estimated that an average of 16 years is needed for a cancer-initiating cell to develop into a 10-mm, clinically detectable tumor, as the averaged volume doubling time in most tumors is about 210-days during exponential growth [7-9]. A vast majority of the studies during the past have consistently shown that a number of genetic, biochemical, and morphologic alterations, including a loss of heterozygosity (LOH), aberrant expression of p53, c-erbB2, CA-125, disruptions of the tumor capsule, and stromal or vascular invasion of epithelial cells, are exclusively or almost exclusively seen in malignant lesions [10-14]. Consequently, these have been considered as malignancy-associated alterations (MAA) or malignant tumor signatures [10-14]. However, a number of studies have reported that: (1). 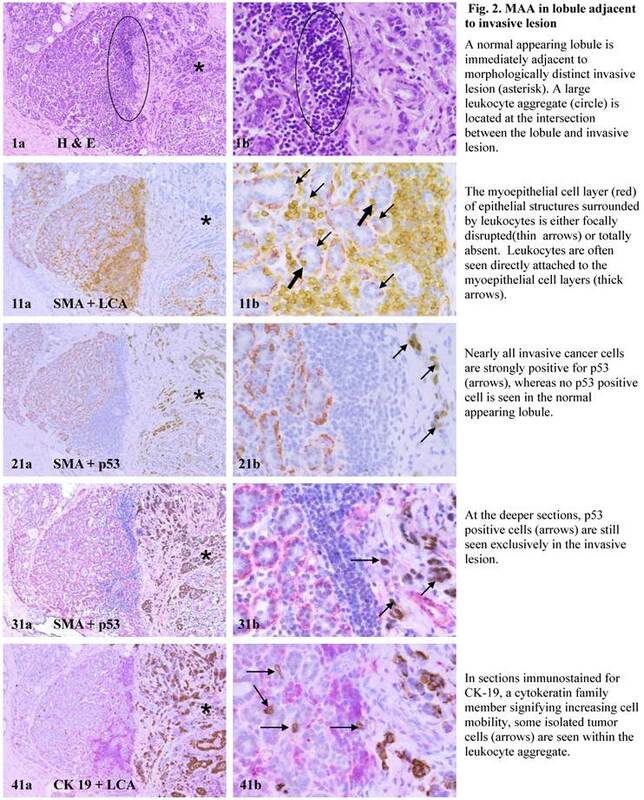 The same pattern of LOH at several chromosome loci was detected in both breast cancer tissues and in adjacent morphologically normal lobules , (2). Some morphologically normal ductal intraepithelial neoplasia (flat type) shared the same LOH and monoclonality identified in adjacent in situ and invasive ductal carcinoma , (3). Some healthy men between 19-29 years old showed a spectrum of proliferative abnormalities, including atypical hyperplasia, prostatic intraepithelial neoplasia, or invasive cancer [17-19], and (4). Prostate tissues of certain healthy man or normal tissues adjacent to prostate cancer showed a DNA phenotype identical to the DNA structure of invasive prostate cancer [20-22]. More recent studies have further revealed that about 15% of human breast and prostate tumors harbor variable numbers of morphologically normal or hyperplastic ductal and acinar structures with malignancy-associated alterations, including aberrant expression of p53 and c-erbB2, focal disruptions of the tumor capsules, and morphological signs of stromal or vascular invasion [23-33]. These structures are distributed as clusters or lobules with a distinct boundary to adjacent counterparts. Microdissected cells from these clusters or lobules showed a substantially elevated frequency of genetic instabilities and expression of invasion-related genes . These findings suggest that the linear model of tumor progression [1-3] may not apply to all cases, and that the morphological features of some tissues may not fully reflect their genetic and biochemical profiles. However, as only a few such cases have been reported, it is not clear whether these tissues represent a previously unrevealed malignant entity, or focal changes with no major consequences. In addition, the structural relationships of these tissues with their adjacent counterparts have yet to be revealed. Thus, our current study intends to expand our previous observations, to assess: (1) whether cells with malignancy-associated changes could originate from these structures, (2) whether these structures are in physical continuity with distinct invasive lesions, and (3) whether aberrant leukocyte infiltration correlates with malignancy-associated alterations within these structures. Five cases harbored large normal human breast ductal or acinar clusters or lobules with malignancy-associated alterations were selected from our previous studies [23-33], in which all tissue samples were retrieved from files of the Armed Forces Institute of Pathology. Consecutive sections at 7-um thickness were prepared and placed sequentially on positive charged slides. For each set of 10 sections, the first 3-4 sections were used for H&E staining and immunohistochemistry. The remaining sections were used for different molecular assays. To identify malignancy-associated alterations, two-technical approaches were used. First, the physical integrity of the capsule surrounding epithelial structures was examined with tumor capsule specific markers, smooth muscle actin (SMA; clone:1A4; Sigma, St. Louis, MO, USA) and/or collagen IV (clone: CIV22, Dako, Carpinteria, CA, USA). 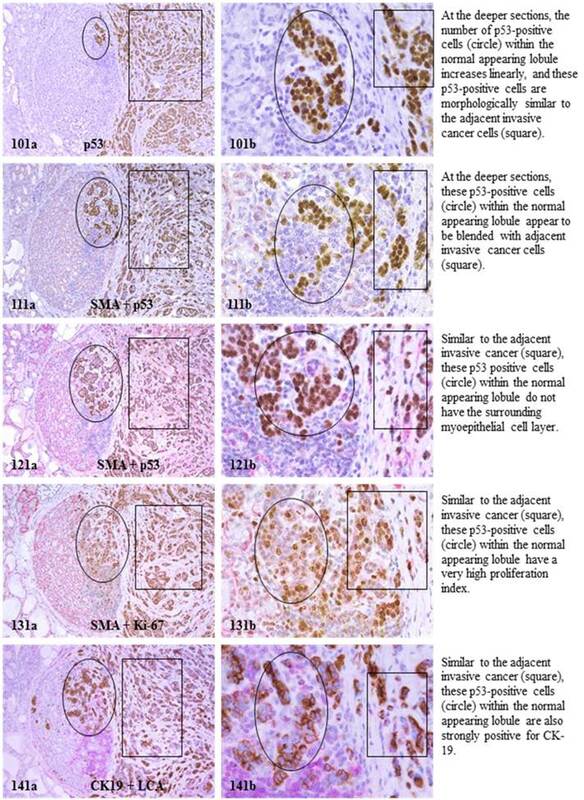 Immunostained sections were examined under high magnification to identify the absence or focal disruptions of the tumor capsule (defined as the absence of myoepithelial cells and/or the basement membrane that results in a gap greater than the combined size of at least 3-myoepithelial cells). Second, sections were double imunostained for SMA and p53 (clone: D07, Dako, Carpinteria, CA, USA) or c-erbB2 (clone:10A7; Novocastra, Newcastle, UK). To differentiate ductal from acinar cells and to assess the impact of aberrant leukocyte infiltration on physical integrity of the myoepithelial cell layers and adhesion molecules, sections were double immunostained for E-cadherin (clone: 36B5; Lab Vision, Fremont, CA,USA) and leukocyte common antigen (LCA, clone:2B11+ PD7/26, USA). To identify isolated epithelial cells within leukocyte aggregates, sections were double immunostained for LCA (which reacts with all hematopoietic cells, including lymphocytes) and cytokeratin (CK) AE1/AE3 (clone; AE1/AE3, Dako, Carpinteria, CA,USA) (which react with all epithelium derived cells). The biological presentation and tissue microenvironment were assessed with a panel of biomarkers, including ER, PR, Ki-67, CK5, CK19, CD31, D2-40, and others. Immunostaining was carried out following manufactures' instruction. The secondary antibody, ABC detection, and DAB chromogen kits were obtained from Vector Laboratories (Burlingame, CA, USA). The AP red-chromogen kit was purchased from Zymad Laboratories (South San Francisco, CA, USA). To assess the specificity of the immunostaining, negative controls included (1) the substitution of the primary antibody with the same isotype or pre-immune serum of the antibody, and (2) the omission of the secondary antibody. The immunostaining procedure was repeated at least twice using the same protocol and the same conditions. A given cell was considered immunoreactive if distinct immunoreactivity was consistently seen in its cytoplasm, membrane, or nucleus, while all negative controls lacked distinct immunostaining. They are indistinguishable from adjacent counterparts in H & E stained sections under low magnification, but under high magnification, they often show a high nuclear-cytoplasm ratio and substantially enlarged nucleoli. In sections immunostained for tumor capsules, the myoepithelial cell layer and basement membrane of these structures are generally discontinuous or focally disrupted, or even totally absent. They were exclusively associated with large leukocyte aggregates, which completely or partially surrounded these structures. Some leukocytes were directly attached to the myoepithelial cell layers. Within leukocyte aggregates, a significant number of isolated epithelial cells was seen. Neither distinct in situ carcinoma nor enlarged tumor nests (with over 50-cells/nest) were seen. In the superficial cuts, p53-positive cell was not detected. The number of p53-positive cells increased linearly in the deeper cuts, and eventually, the entire lobule was replaced by p53-positive cells. These p53-positive cells lacked E-cadherin expression with morphological features of lobular cells. These p53-positive cells also lacked the surrounding myoepithelial cell layer and the basement membrane, a typical feature of invasive cancers. These p53-positive cells were eventually blended with morphologically distinct invasive cancer cells. Leukocyte aggregates were exclusively or preferentially located at the junctions between these normal appearing structures and invasive lesion, and seemed to “flow” or “migrate” to different locations, correlating with the emergence of p53-positive cells. The above features are depicted in the following two sets of consecutive sections. The first set elucidates malignancy-associated alterations in lobules distant from invasive lesion. The second set shows similar alterations in a normal-appearing lobule immediately adjacent to the invasive component. Each number at the figure sets represents the sequential number of the sections. he above findings further suggest that lobular structures. These clusters or lobules were not associated with morphologically distinct in situ or large tumor nests. 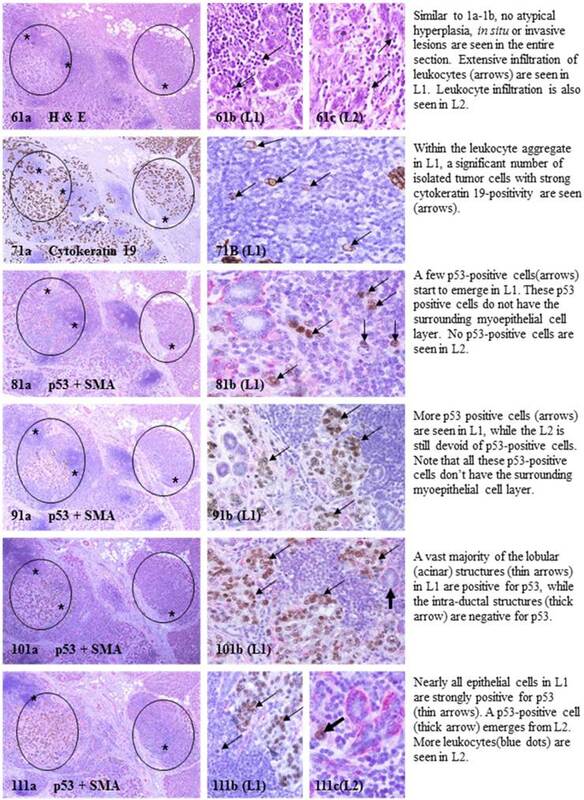 Cells with malignancy-associated alterations (including strong p53-positivity, the absence of myoepithelial cell layers and the basement membrane, a high nuclear-cytoplasm ratio and substantially enlarged nucleoli, significantly elevated cell proliferation, morphological resemblance and physical continuity with invasive lesions, and disassociation from main structures) could originate from morphologically normal structures. The number of cells with malignancy-associated alterations linearly increased in consecutive sections, and these cells were eventually blended with morphologically distinct invasive lesions. Leukocyte aggregates were exclusively located at the junctions between these structures and invasive lesion, and seemed to “flow” or “migrate” to different locations, correlating with emergence of p53-positive cells. Together, these findings suggest that malignant transformation and stromal invasion could originate or emerge from morphologically normal structures. Based on these and previous findings, these morphologically normal- or hyperplastic-clusters and lobules seem to represent a previously unrevealed malignant entity that has acquired significant genetic abnormalities and could directly progress to invasive or metastatic breast lesions. This speculation is consistent with the “sick lobe” theory of breast carcinogenesis proposed by Tot at al [34, 35], which suggests that “The sick lobe carries some kind of genetic instability already from its initialization during the early embryonic life and is more sensitive to noxious influences than the other lobes within the same breast”. The exact cause for the formation of these lobules is unknown, but could potentially result from diagnostic or therapeutic radiation exposure at the very early age [36,37], which may have resulted in significant genetic damages on a subset of stem cells within these lobules, especially those for myoepithelial cells. Myoepithelial cells are also very sensitive to certain chemicals. For example, exposure to lambdacarrageenan can specifically result in filament disassembly and loss of myoepithelial cells, whereas exposure to oxytocin could substantially enhance myoepithelial cell differentiation and proliferation in mouse breasts [38,39]. Damages to myoepithelial stem cells can direct impair the normal replenishment process, resulting in an aged or inactive myoepithelial cell population. As the myoepithelial cell layer is the sole source of several tumor suppressors, damages to this cell layer could lead to the loss of its paracrine inhibitory functions on tumor cell proliferation [40-42]. MMA in lobule distant from invasive lesion. MAA in lobule adjacent to invasive lesion. 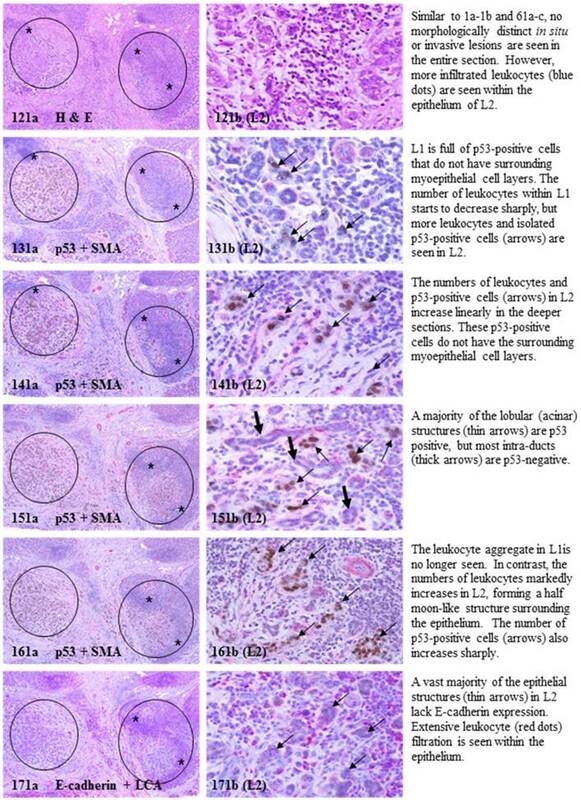 The mechanism(s) for progression of these normal- or hyperplastic-appearing tissues is also unknown, but it appears to be triggered by leukocyte infiltration for the following reasons: (1). Pregnancy associated and inflammatory breast cancers, which have extensive leukocyte infiltration, have the most aggressive clinical course and worst prognosis among breast malignancies [43,44], (2).Increased leukocyte infiltration correlated with substantially elevated tumor cell proliferation in prostate tumors , (3). Increased leukocyte infiltration correlated with progression of oral epithelium from hyperkeratosis to dysplasia, and to carcinoma , and (4). Pre-invasive prostate tumors with chronic inflammation had a significantly higher rate of subsequent invasive tumors than morphologically similar lesions without chronic inflammation . Our recent in vitro study has revealed that protease-degraded collagen I fragments could function as a specific mediator to attract macrophage infiltration . Thus, the formation of leukocyte aggregates within these clusters or lobules is likely to result from increased degradation of the myoepithelial cells and the basement membrane. Our previous studies in multiple types of human tumors, including those in breast, prostate, cervix, and lung, have revealed that leukocytes could facilitate tumor cell invasion or metastasis through 3-correlated pathways [32,49]: (1). The physical movement of leukocytes into the epithelial cells disrupts the inter-cellular junctions and cell surface adhesion molecules, causing the disassociation of tumor cells from the tumor core, (2). Leukocytes are conjoined with some of these tumor cells through plasma membrane fusion, creating tumor cell-leukocyte chimeras (TLCs), and (3). The leukocytes of TLCs impart migratory capacity to the associated tumor cell partners, physically dragging them to different tissue sites. Thus, the entire luminal cell population within these clusters or lobules could directly invade the stroma when its entire surrounding myoepithelial cell layer become degenerated and disrupted. Although these cells might not possess all the properties of invasive cancer cells, the changed microenvironment may act as a second “hit” to trigger a cascade reaction of malignant transformation that rapidly alters the genetic and biochemical profiles of these cells. This speculation is supported by the fact that major single-gene defects, such as a mutation in the BRCA1 or BRCA2, could cause significantly higher cancer incidence and early cancer onset in their inheritance patterns . This speculation is further supported by a recent study, which has shown that interstitial flow emanated from tumors into their microenvironment could promotes tumor cell invasion by influencing cell behavior and modulating cell-cell interactions [51,52]. Due to these unique presentations, these “sick” lobules or cell cluster may represent the “seeds” or precursors for cancer of unknown primary site, which is one of the 10 most frequent cancers worldwide and ranks as the 4th most common cause of cancer-related death [53-55]. The development of early, uncommon, systemic metastasis, and resistance to therapy are hallmarks of this clinical entity or condition/outcome. In addition, these “sick” lobules or tissues could also be potentially associated with childhood cancer [36,37], in which diagnostic or therapeutic radiation exposure function as a cancer “initiator” or “promoter”. 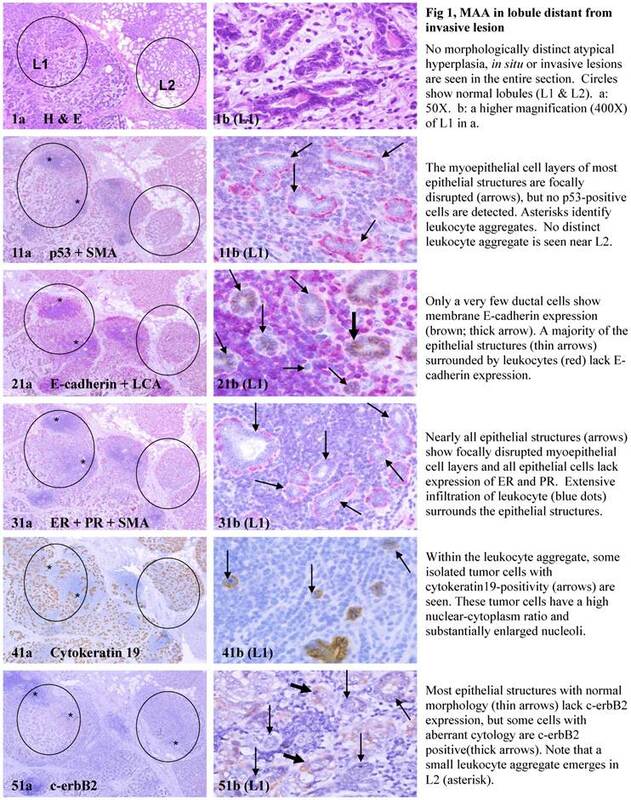 However, a conclusive classification of these normal appearing structures could not be made at present for the following reasons: (1) aberrant expression of p53 or e-cebB2 is not a conclusive sign of tumor malignancy, (2) a genome-wide comparison with distinct malignant lesions has not been made, (3) the large lobule structures are seen mainly in pregnancy-associated cancer, which may not be highly representative for the general population, (4) no clinical follow-up data are available for these cases, and (5) we need to test more samples to demonstrate statistical significance. 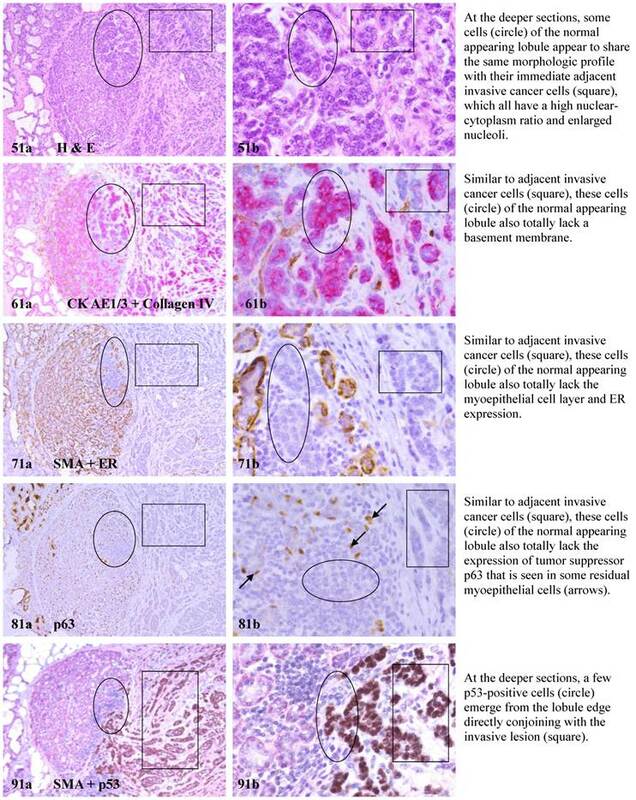 On the other hand, as it is estimated that an average of 16 years (30-doubling times) are needed for a cancer-initiating cell to develop into a 10-mm, clinically detectable tumor [7-9], it is also possible that these malignancy-associated alterations in these normal or hyperplastic appearing structures may be focal and transient with no significant consequences. Comments from well recognized experts in the field. This study was supported in part by research grants DAMD17-01-1-0129, DAMD17-01-1-0130, PC051308 from Congressionally Medical Research Programs, BCTR0706983 from The Susan G. Komen Breast Cancer Foundation, 2006CB910505 from the Ministry of Chinese Science and Technology Department, and 2008-02 from the US Military Cancer Institute and Henry M. Jackson Foundation to Dr. Yan-gao Man. Some of the experimental procedures of this study were conducted in the Armed Forces Institute of Pathology (AFIP) and the American Registry of Pathology (ARP), in which Dr. Man served as the director of Gynecologic and Breast Research Laboratory from January 1,1995 to March 31, 2011. Dr. Man is very grateful to Dr. Renata B. Greenspan, the former director of the AFIP, to Dr. Florabel G. Mullick, the current director of the AFIP, and to Dr. William A. Gardner, the executive director of the ARP for their guidance and unreserved support to his research projects. As the entire Research Section of the AFIP had been permanently disestablished and the Diagnostic Section of the AFIP has been replaced by the Joint Pathology Center by the US Congress, Dr. Man has accepted a senior scientist position kindly offered by the Henry Jackson Foundation.